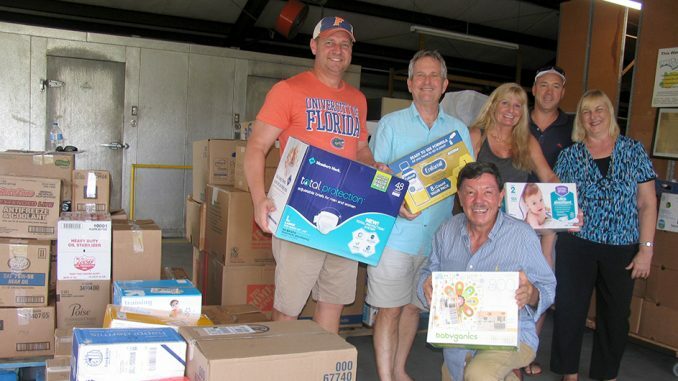 Operation Hope board members David Alpizar, Michael Carey, Julie Decker, David Patterson, Jann Zermeno and Jesse Zermeno received donations from the Brevard Hispanic Center to help the people from Puerto Rico after Hurricane Maria devastated the Island. FELLSMERE — There are several non-profit organizations providing support to the victims left in the aftermath of Hurricane Maria’s devastating strike on Puerto Rico. Now Operation Hope is one of them. The Fellsmere-based headquarters is now offering its campus as a temporary shelter for approximately 300 people affected by Maria. The housing is being offered as island’s electrical service is being restored and the debris left behind by the storm, cleaned up . “The wreckage has been immense in Puerto Rico and thousands of affected human beings have been left with nothing and need our help,” said Jesse Zermeño, founder of the organization. The catastrophic storm struck the island September 20 and killed 34 people. Thousands of houses across the island damaged and roads collapsed. However, Operation Hope’s willingness to help did not wait. Operation Hope has collected food, clothing, first aid supplies, batteries, towels and more. Supplies donated by public and private institutions will be collected until Friday, October 6 and will be sent to Miami for transportation to the island. “We have a great team of volunteers mobilizing everything and our facilities are ready to receive those affected until the conditions necessary to return to the island are restored,” Zermeño said. Zermeño credits the organization’s success to volunteers like Peggy Sowders, director of food services of Daily Bread in Melbourne. “Operation Hope is very grateful to Peggy Sowders for everything she does for the children and families in our community,” he said. Jesse Zermeño founded Operation Hope in 1997, after seeing firsthand the overwhelming reality facing hundreds of Hispanic immigrants living in overcrowded conditions in Fellsmere. Most of the immigrants work in agriculture and endure harsh realities, he pointed out. “It was a situation that left a huge impression on me. I then collected what little I could with other good people who were able to help me and gave a little joy to these families in need,” he said. Today he and his wife, Jann Zermeño, lead Operation Hope and serve more than 14,000 people through 120 volunteers. They not only participate in Thanksgiving and Christmas Day events, but also on other important dates such as Mother’s Day, Father’s Day and “Back to School” events in which 700 children benefit from basic materials such as backpacks, notebooks, pencils, and glue. “Our firm determination to improve the living conditions of these families goes beyond material resources because we also offer words of encouragement and support,” added Zermeño. In 2004, Operation Hope was inaugurated. Facilities that were once an outdoor flea market were converted into the home of the organization and in 2006, the preschool was created. Throughout the past 18 years, Operation Hope has delivered more than 16,000 turkeys to low income families for Thanksgiving. “This year will be no exception,” organizers said. In November, this nonprofit foundation will give away 900 turkeys and a food basket in order to help people with their Thanksgiving dinners. These will be given away at the headquarters located at 12285 Country Rd- 512, Fellsmere. Jesse Zermeño, founder of the organization, says that it is only thanks to companies’ donations, businesses, volunteers, and churches that this event is possible. “We seek not only to give hope but also to improve the living conditions of many families without economic resources,” he said. Operation Hope, ever since its founding 20 years ago, has lead five important events for the integration of families and has desired to promote values such as unity. One example is the Christmas celebration. “During the Christmas season, the organization is predicted to deliver 6,000 new toys to children,” Zermeño told us. “This is the best event of the year because it means so much more than just the toys. The families get to enjoy a huge festival with clowns, live music, wizards, a puppet show, games, raffles, food, and fun,” shared Operation Hope founder. Operation Hope is located in 12285 Co Rd 512, Fellsmere, and the organization’s phone number is (772) 571-0003. Excellent Javier. The community needs to know this. Our folks from Puerto Rico need to know this so they know where they can get help.